Wow, Joe Joans showed his gratitude for the support of her fans by slipping on an apron and cooking up a storm! 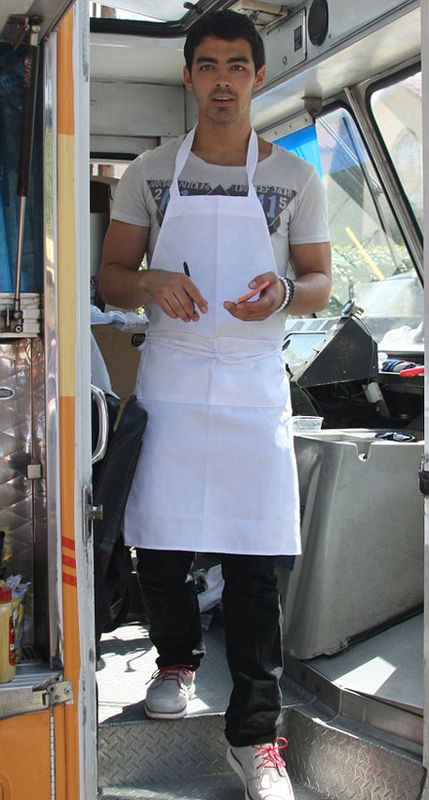 Joe grilled burgers while manning a food truck in Silverlake, California. The singer divided his time between cooking grilled cheese sandwiches and hamburgers, and chatting to his fans while taking their orders. The event was held in a bid to collect money for Eton Academy, a school for children with learning difficulties. 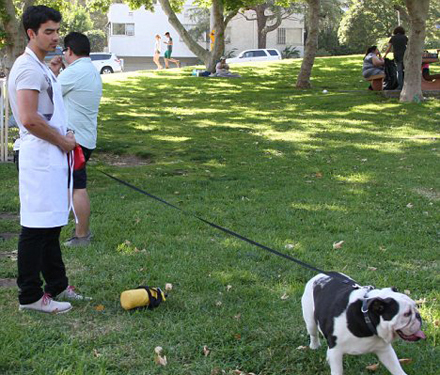 Joe Jonas appeared at Eton Academy Food Truck Fundraiser. Joe was dressed casually under his apron in a cream T-shirt, black jeans and lace-up shoes. He was joined at the fundraiser by his friend and Camp Rock co-star Meaghan Martin. Meaghan looked flirty in an turquoise floral summer dress. The 20 yo combined her beautiful dress with turquoise wedges. She and Joe took it in turns to draw in crowds by shouting through a megaphone. Meaghan wasn’t Joe’s only companion at the event as he was also joined by his black and white bulldog Winston. Although the throng of female fans eager to meet Joe should suggest he would have no problem finding a girlfriend, Joe is in fact turning to a dating television show for help in his love life. Joe appears alongside a host of other celebrities including Rob Kardashian, The Situation and Carmen Electra on The Choice, a blind dating series kicking off next month which follows the premise of The Voice.